i would not call it a resort. the best thing about the area is the waterpark. As mentioned above the hotel was nice and bright and very clean. We didn't visit the beach even though the hotel also provided a bus daily to and from the beach. The hotel and waterpark are slightly remote so if you are feeling adventurous you could try hiring a car. We didn't as we just wanted a nice relaxing holiday with the added bonus of the waterpark. We were also extremely lucky with the weather as we had brilliant sunshine from morning to night every day, with the temperatures in their mid 30's. We went into Corfu town one evening on the hotel courtesy bus, which left at 6pm and picked you up at 10.30pm, which was nice for a change but again it was really quiet and shop/restaurant owners were trying to get you to go into/buy from them, which if you just wanted to look could be a bit annoying! We think that we were overcharged for our meal that we had out, but maybe it is because the exchange rate is almost 1:1 at the moment. All the Greeks were very friendly and really appreciated a few words in Greek - like hello, please, thanks - and they all spoke excellent English. I would just like to say that we all had a brilliant time and would definately go back. The beach isn't the cleanest but isn't filthy, this is mainly due to tourists dropping litter although there are plenty of bins provided. There are water sports available but we were never hassled by the people doing these. The sea is fairly shallow for quite a way out and can be cold the deeper you get. The smally jetty has a few boats moored and is abundent with sea life. You will see quite a few people fishing from here and there is quite a few crabs, shrimps etc to see as well. The main strip through Sidari town centre is lined with shops and restaurants, we would recommend Memories restaurant for evening meals who have regular fire dancing/plate smashing nights and the food and service was excellent every time we ate here, Sea Breeze was also good and well priced. B.E.D. bar is good for breakfasts and lunches. There are some touts in the evenings which is tobe expected but they were never rude. We would visi Sidari again but maybe somewhere in the Canal D'Amour area which is a lot closer to the resort centre. I can only comment on corfu town as I didn't go to a beach. The town is busy with quaint streets with the usual touristy shops. I didn't think the town was that big and I do like a good walk around. Because of the euro it wasn't that cheap so be careful. The town has the usual clothes shops even Marks and Spencer which I think was more expensive than home. Still it was nice to visit. I cannot say that the area we stayed was a resort as there was nothing other than a petrol station. No bars, no shops very boring. Taxi to Corfu town varied between 15 and 20 euros. The bus was 1 euro. Very difficult to get taxi from town back to aqualand. The beaches are gorgeous with very clear waters. The town we visited was very clean and friendly although all the shops are basically the same. Actual Corfu town is very nice although it was too hot to walk around as we went midday. All in all I would definately visit Corfu again. The beach was man-made and was our favourite place to chill-out. The entertainment programme mainly catered for kids with a late evening stage disco & a singer in the bar usually but we came to find a spot to relax & on its many levels, provided an excellent setting for us to do that. When I refer to the resort I am referring to inside the boundary of Aqualand. Outside the gates there was no resort to speak of. The resort and water park were clean. The Aqualand animation team worked hard and with the limited number of people and limited number of props provided us with varied light hearted entertainment. Saturday was a washout as the water park closed, as did most of the shops in Corfu town early evening. The Saturday evening entertainment in Aqualand was a video. So if you are going to pay the 30 Euro taxi fare (round trip) to hit the nightclubs, do this on Saturday evening. Our experience of the close down on Saturday evening may well have been because it was the end of the season. 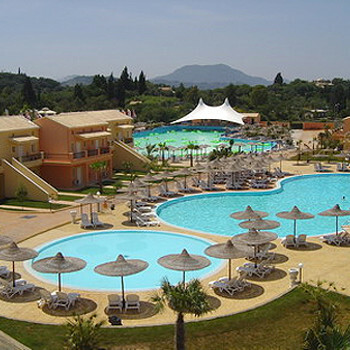 Resort,wouldnt really class it as that. Its more a couple of shops ,hotels,tavernas and thats it. Quite,peaceful and away from it all.Definitely for the customers of the hotel Marbella. The resort was 3 km away from Benitses and 4 km away from Moratika. Benitses offered the cheapest shopping, while Moratika offered the most entertainment, clubs and restaurant. There was plenty to do if you wanted to visit the area : Scooter or car for hire, Boat trip to the mainland and other areas of Corfu, Trips to Aqualand (aquatic park), plus tennis, pedaloes, canoes, water polo, archery etc. but if you wanted to do nothing it was great also. Lie on a lilo all day on the sea, read a good book on the beach lounger, or eat and drink your heart away. I can say that I could certainly do that more than once a year if only!